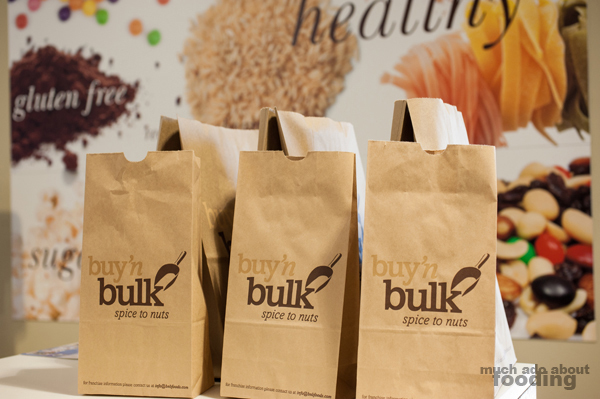 We had heard about and seen pictures of Buy N Bulk before but hadn't made our way to Lake Forest to visit until a few weeks ago. Upon entering and seeing their products, I wondered how I could have stayed away before. It is a playground of ingredients for everyone. 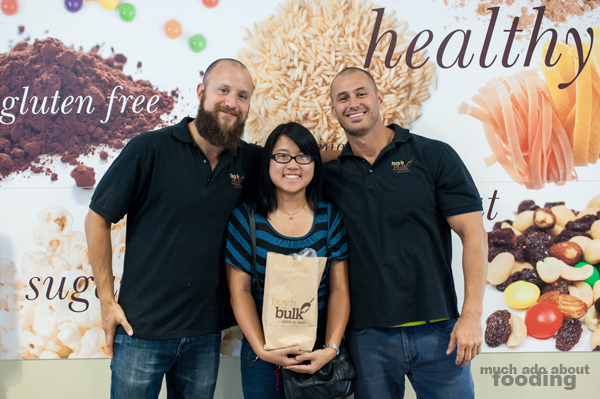 A concept thought up in early 2011 to be brought to Southern California, Buy N Bulk in Lake Forest is the first store in the US for its main company which is based out of Toronto and known there as Bulk Barn. 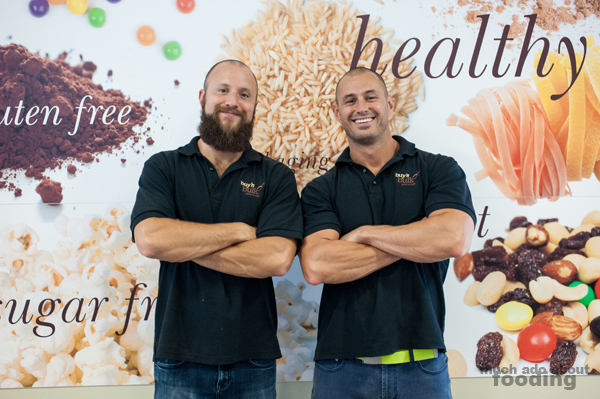 This bulk food buildout in Orange County comes from father-and-son team Steve and Adam Wilks of whom we met the latter. It was set up at the end of September 2012 and has been very well-received so far. Perhaps it is because they focus on healthy lifestyles and fresh food choices. With an emphasis on making themselves economical and environmentally friendly, Buy N Bulk carries thousands of products worldwide and from that running list of 250,000+ products to stock, the Lake Forest store has more than 1,000 bins. We stepped inside, and everything was so neatly organized and clean. It was definitely an expansive building at just under 4,000 sq. ft of space and wide aisles for shoppers to walk through. The plans for the next few stores have them eyeballed at about 2,500 sq. ft, though there will still be ample space to move around. The experience is helpful as staffs move around helping customers find what they are looking for, and these customers tend to be health and eco-conscious ones. I spoke with Adam Wilks and Chris Carson about their store during our visit, learning that the majority of the products come from Amish country in Pennsylvania and are highly quality-controlled. The categories were numerous, and the one that drew me in were the spices and seasonings section. With salts coming in at ~.02/oz and other spices showing inexpensive price tags, I couldn't avoid grabbing a few bags myself. They also have blends & rubs prepackaged as well. Adam explained to us that they are constantly price shopping on all ingredients and trying to keep themselves lower in a range of anywhere from 30-70% from other retail prices. I could believe it when I saw just how many herbs and spices I could purchase for what seemed like pennies. So they are a buy-what-you-need type of store that doesn't pressure their customers to purchase large quantities. Granted, that does happen sometimes but it isn't the main focus. I liked that philosophy because there does seem to be a lot of food waste out there. 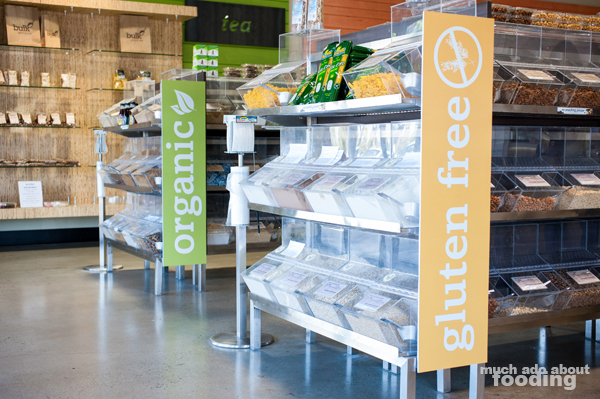 Additionally, they keep their ingredients fresh, with all of their products and bins monitored through an automated shelf life tracker on their computers. If the product is starting to near the end of its shelf life, it gets donated to a place that will use it immediately/that day. Luckily for Buy N Bulk, they haven't needed to get rid of large quantities of product since their opening. With more than 1,000 bins of products at the store, Buy N Bulk had me wondering which products they hadn't been able to sell in the past. 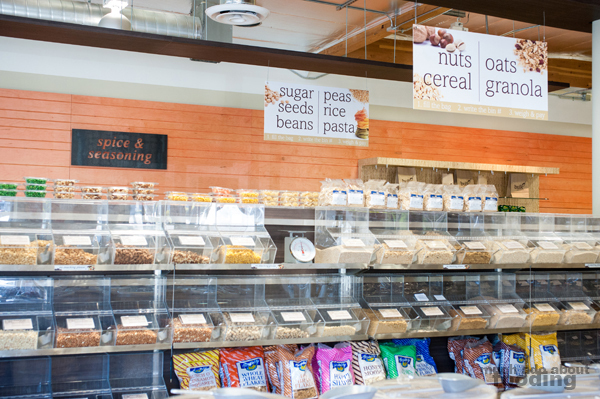 Ones that fly off the shelves and always seem to be en route in an order no matter how large the inventory is at the store were things like saffron jasmine rice, gluten-free granola, and oats. Ones that have had to be switched out with more popular products included cocoa almonds, Cajun peanuts, and some candies and chocolates. Another success that they have had with items being sold quickly is through their customers of preschools and event planners who may need large bags of a particular item or another for their business. Preschools are the main purchasers of their big bag cereals and snacks whereas event planners will grab up custom amounts of candies and chocolates to coordinate themes. There is certainly no shortage of product. I found some unique ones like spelt, German Black Rye Bread mix, Taco supper, and Xylitol which are more difficult to find elsewhere. These and other harder-to-find ingredients are good reason to come to Buy N Bulk. Another good reason are for all of the mixes that will expedite the meal cooking and planning process after a long day at work. Rice mixes are available for you just to add water to as are pastas. Soups and broths come in powdered form and will run from $2.50-$6.00/lb to be reconstituted again with just water. 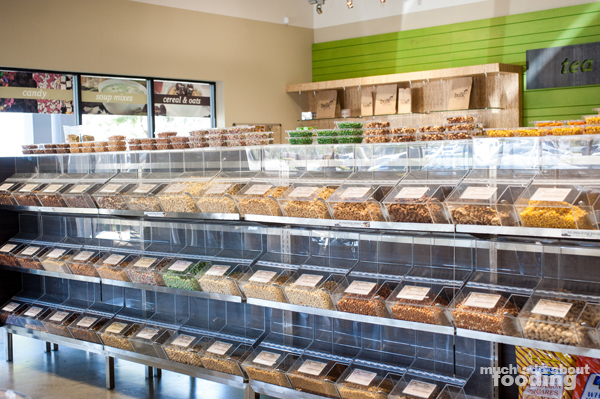 You'll find beans, seeds, cereals, and dried fruits (including the rarer kiwi and cantaloupe fruits) as well as barrels of snack mixes. Some of the most popular items are saffron jasmine rice, crisp vegetable chips, almond flour and all things gluten-free, large cereals, nuts of all kinds raw and flavored, and especially holiday items. I found the prepackaged boxes neat because they are guaranteed to be $2 each regardless of their contents. 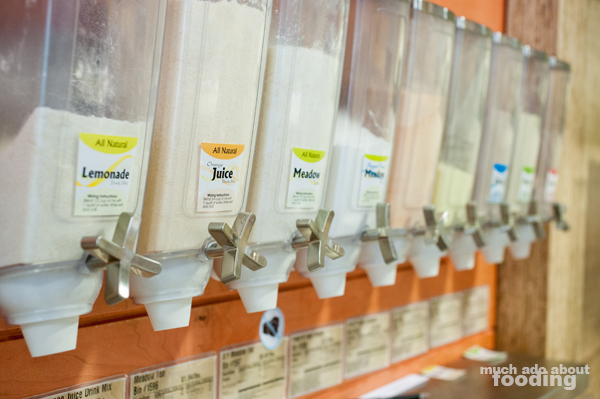 There were even drink mixes and protein shake powders in dispensers along the wall to buy. 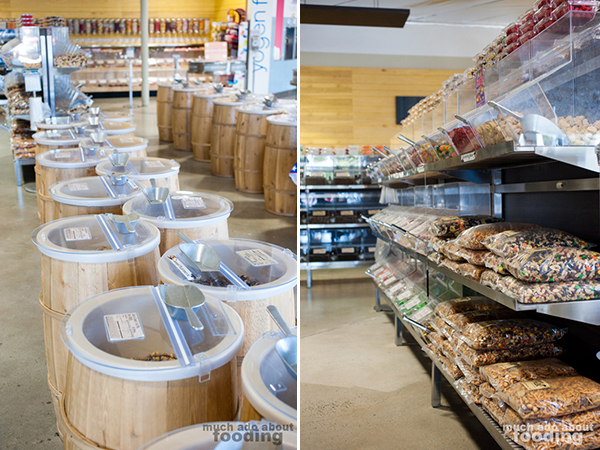 One of the most impressive sections for me in the store were their baking and candy products. 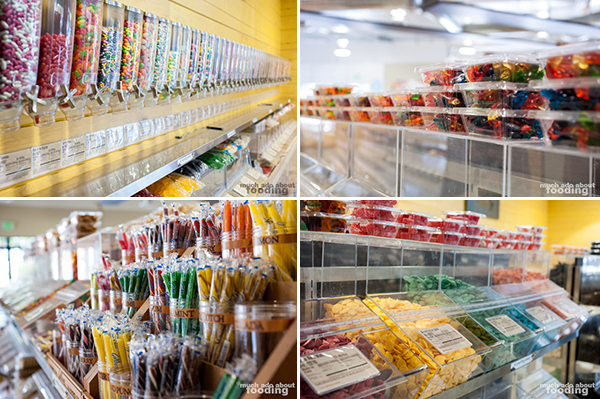 Their expansive bulk candy selection rivals many candy stores in the county in terms of choices but basically trumps them in regards to pricing. 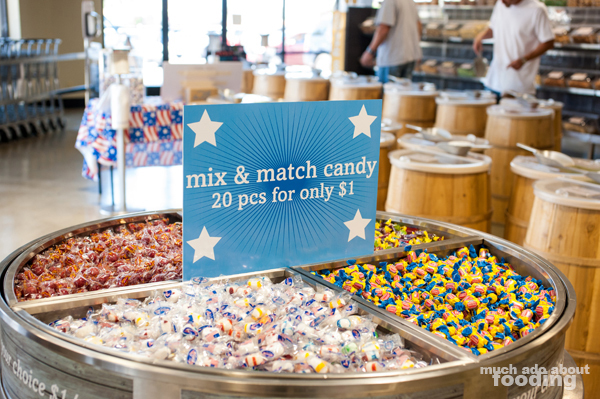 At just about $5/lb for nearly all of the candies, Buy N Bulk is easily a contender in the candy market. I'm not referring to generic candies either - we saw many popular and beloved candies in the bins. 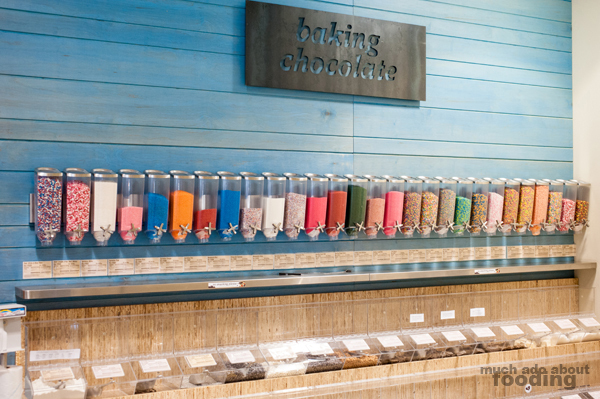 One portion of the baking section that incorporated candy elements had sprinkles and toppings of all shapes, sizes, and colors and is is popular area of the store for event planners to browse. Having a dinosaur-themed birthday party? How about a graduation one? Maybe a 4th of July barbecue? Buy N Bulk has you covered. If you want to bake all your things from scratch, you can find loads and loads of differing types of flours (almond flour being the most popular). Bread mixes are less than $2/lb and baked good mixes are in the same range but with a handful being $2.50/lb. Pudding mixes are available as are gelatin. Blocks of yeast sit on the shelves around the store, ready to be turned into something delicious. There are also bins of varying bread crumbs, dressings & dips mixes, and even gravies. If the bulk stuff isn't impressive enough to lure you into the store, you should reconsider your decision due to another section of the store. 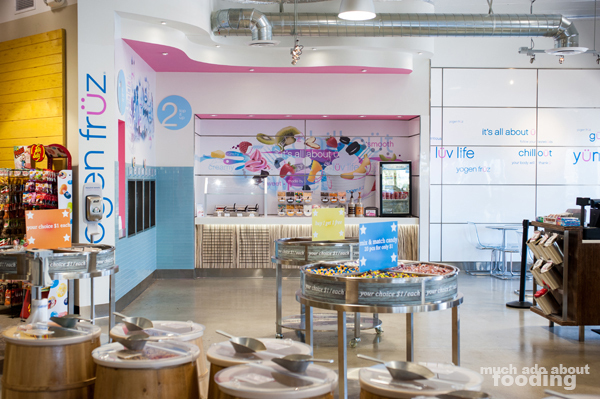 It's a Yogenfruz, the biggest chain of frozen yogurt worldwide which focuses on keeping its product gluten-free and artificial ingredients-free. I thought about it often as I could see the station from the corner of my eye as I walked along the aisles. Yogurt-covered pretzels in the candy section tempted even more. Eventually we had tasters of the yogurt which was one of the smoothest we've ever had. 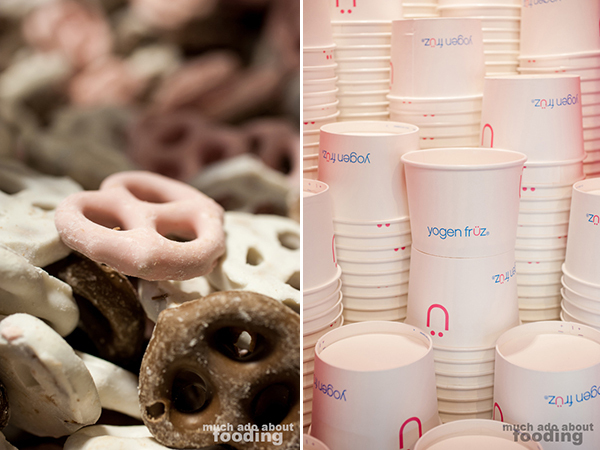 If you're curious about Yogenfruz, do not hesitate. Their most popular item at the time of our visit was their Blue Ribbon Berry Pie. You should check in with what it is at the time of your visit but know that they're all quite delicious. 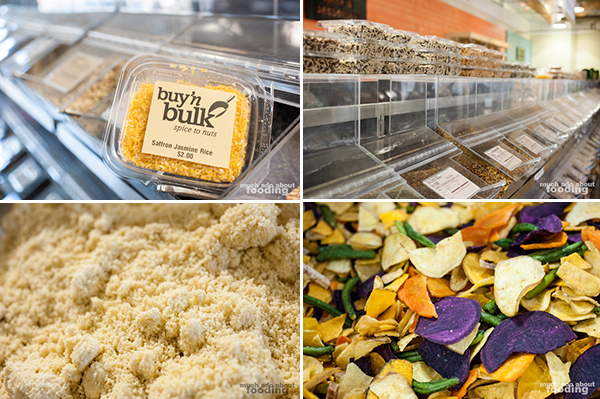 Hopefully the pictures and recap of our visit have given you a fair sense of the Buy N Bulk store. They are aiming to be the premier food retailer for southern California and have their sights on somewhere more northern in Orange County for the next store. We were tipped that a scouted location is in Fountain Valley, and if that ends up being the case, don't expect me to miss a week of not visiting! I know that there are bins upon bins of great ingredients waiting for me to try. They also do give access to customers to more than 250 recipes using their products so you could even walk in to find yourself a challenge. Visit them from 9AM-9PM daily at 22343 El Toro Road in Lake Forest. To get you ready for your first visit there, Buy N Bulk has graciously donated a $25 gift card to one lucky winner to their store. Check the widget below for more details. Our BIG thanks go out to Adam and Chris for showing us around Buy N Bulk and for granting us a giveaway opportunity. So readers, put in your entries today! Photography by Duc Duong. More photography available on Facebook here. The giveaway will run until 7/21/13 at 11:59pm PST. Winner will be contacted upon winning and has 48 hours to respond before another winner is drawn. 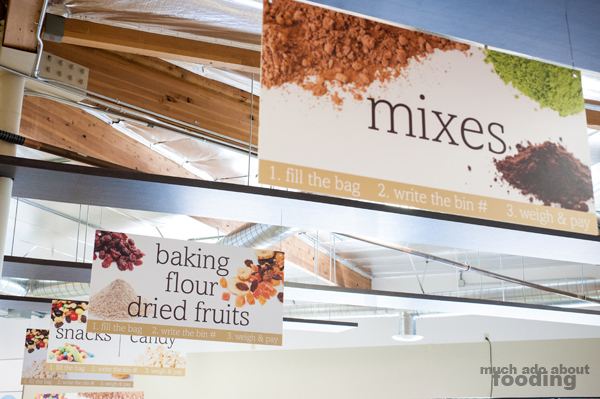 I like the idea of mixes for baking. They look like they'll really come in handy! 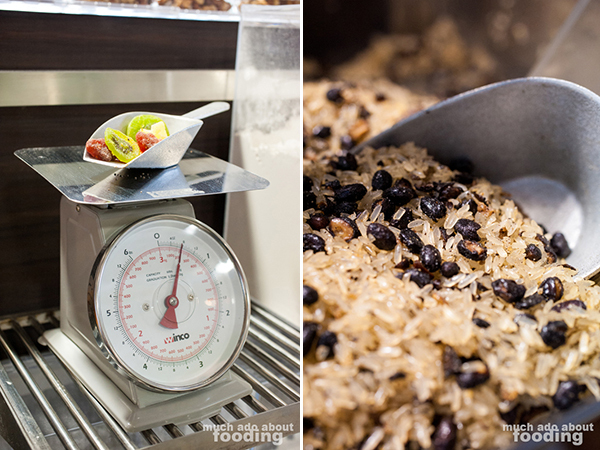 I would like to buy different grains and stock up, since I'm always buying small amounts. Always good to have things on hand right? You're telling me! I had to be pried away from the spices section. 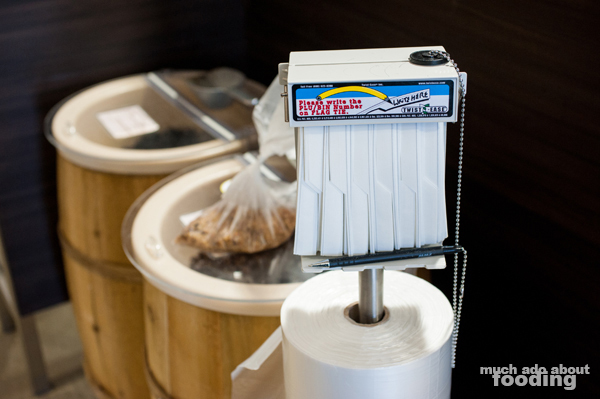 it could save me time, so I wouldn't have to stop at Vons, Whole Foods, and Trader Joes to get my dry goods needs! any idea how much nuts were a pound? almonds, walnuts, peanuts, for example? Can't remember off the top of my head BUT I do know that they are quite cheaper than regular retail store prices. They try to be 30-70% cheaper on all of their products. Buying at a bulk store is definitely cheaper since there are some items that I only need very little of and not a whole bag of. Absolutely why this place exists! I love buying certain things in bulk and I'm glad there's a place closer to me to do this instead of driving to LA. Where were you going before? This place looks amazing! I can't wait to go. My guess is it won't save me any time at all the first round because it appears there is so much to see I will probably play!